Japan consists of “about” 6.852 islands (a surprisingly accurate number for an approximate value), but the four home islands Honshu, Hokkaido, Kyushu and Shikoku make up about 97 percent of the land mass. The main islands stretch over a distance of more than 2.000 kilometers from the Northeast to the Southwest. The islands are of volcanic origin, many volcanoes are still active today and frequent earthquakes are a part of everyday life. The highest mountain is the sacred Fuji-san (富士山) at a height of 3776,24 meters. Fuji-san, seen from Ōwakudani on the Hakone volcano. Hokkaido is on the same geographic latitude as the Alps and drowns in snow during the Winter, that’s why the 1972 Winter Olympics were held in Sapporo. Tokyo on the other hand is located in the middle of the biggest island, Honshu, and therefore on the same latitude as Malta. Here the temperatures rarely go below zero degrees Celsius in Winter, but already climb above 30° Celsius in Summer. Naha, the capital of Okinawa, the southernmost island, is nearly on the same latitude as Dubai. Here the water temperature never goes below 23° Celsius. 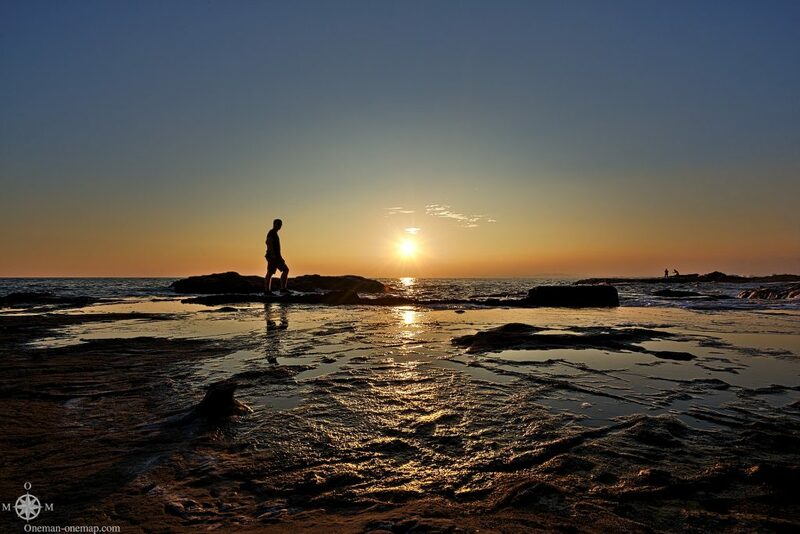 Sunset on Enoshima near Tokyo. The landscapes have a lot to offer. Some parts of the country look like Switzerland, Germany or Sweden, while Okinawa easily passes as a tropical paradise. Definitely one of the most beautiful countries I’ve ever been to! Japan was probably already inhabited more than 10.000 years ago. February 11, 600 BC, the day when the mythical Tennō Jimmu rose to power, is celebrated as National Foundation Day. There was a strong cultural exchange especially with China, many parts of “typical Japanese culture” stem from the eight century AD. What’s not widely known is that a smallpox epidemic seems to have killed about a third of the population during the same time. Up until the second half of the 17th century there have been countless wars and fights between the various Japanese kingdoms, empires and feudal lords, the kingdoms on the Korean Peninsula, the emperors of China, and the Mongolians. Well-known around the world from that time are the Samurai, the members of the Japanese warrior caste, the countless castles, fortresses and gardens. 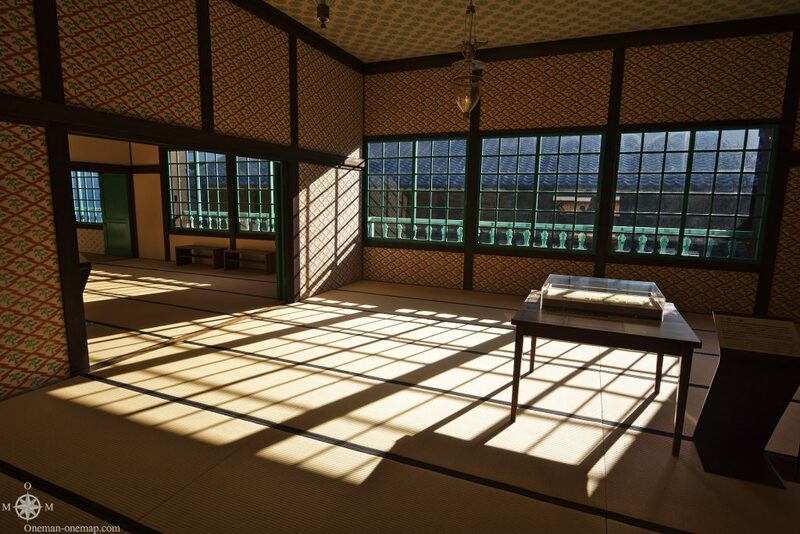 Dutch building on Dejima, Nagasaki. Due to the beginning exchange with the Western nations (especially Portugal) in the 16th century, feudal lord Oda Nobunaga and his heirs came into possession of modern weapons and managed to unite the country. In 1639 the Sakoku, the Closed Country, was finally implemented. The whole country was isolated from the outside world for 220 years until the Americans attacked in 1853. Only the Dutch were allowed to continue to land in the enclave of Dejima in Nagasaki, but trade and cultural exchange were extremely limited. After the Americans had forced Japan to open up to foreign trade again, Emperor Meiji initiated an unprecedented period of restoration. Within just forty years the underdeveloped country turned into a modern industrial nation which threw itself into the First Sino-Japanese War and the First Russo-Japanese War and had conquered Taiwan, the Korean Peninsula an the southern half of Sakhalin by 1905. The expansionism only ended in 1945 after two atomic bombs had been dropped onto Hiroshima and Nagasaki. Together with the critical meltdown in the Fukushima Daiichi Japan is the only country in the world which had to endure three nuclear disasters on its soil. 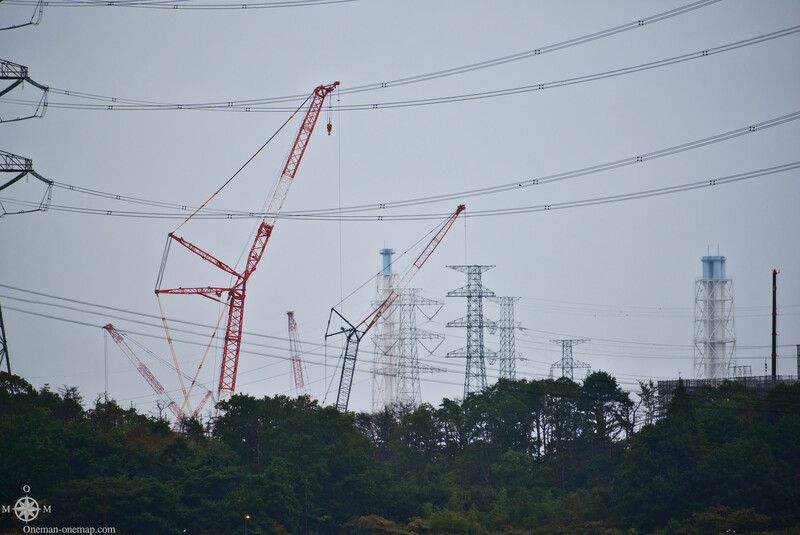 The cranes over the Fukushima Daiichi Nuclear Power Plant from a distance of just two kilometers. After the Second World War Japan became a world leader in the fabrication of vehicles, electronics and optics. With Nikon, Sony and Canon all major manufacturers of camera equipment are still located in Japan. The country has been fighting recession after recession since the 1990s. Public debt has climbed to 243 percent of the GDP, the 9 trillion Euros aren’t much less than the United State’s 13 trillion, but the USA have 323 million inhabitants and Japan has just 127 million. Japanese is easy to speak, but very hard to read and write. There are three different writing systems: Kanji, the sign language borrowed from China, Hiragana, a syllabary with 45 signs still in use, and Katakana, a syllabary with 48 signs which might have originated in Korea. 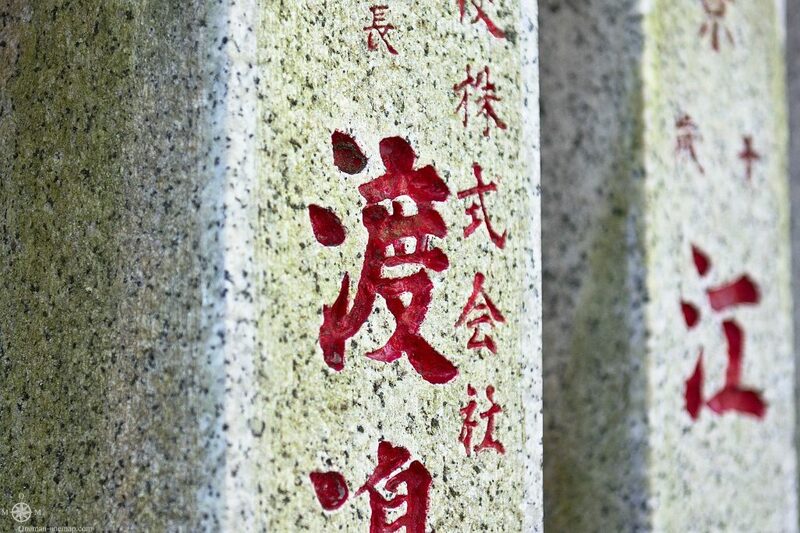 Japanese writings on a shrine in Enoshima. Like in many other countries you get a lot of bonus points just for trying to speak Japanese. Most Japanese have had several years of English lessons during their school years, but don’t actually speak any due to a lack of exercise. On the other hand there are some people who speak English very well. In practice you try to establish how well the other person speaks your language and then establish a common level of understanding. Understatement is normal, if you ask Anata wa eigo ga hanasemasu ka (Do you speak English?) and a person answers “A little” instead of “No”, they most definitely speak at least acceptable English. We didn’t even bother with the writing part during my two semesters of Japanese lessons. It’s simply impossible to learn the necessary ~500 basic Kanji in just a year, and you can’t really do much with less than that. A Kanji can have multiple meanings, which even leads to the routine question of how another person’s name is written correctly. And the three writing systems are used at the same time in most sentences, which complicates things even more. There is now a whole list of cities whose names are no longer written using Kanji, but Hiragana or Katakana. Roughly speaking the population of Russia lives on the area of Germany, but due to the many mountainous regions huge parts of the country are no good for building houses. The population densities are extremely high, land is very expensive, the apartments are small and most streets narrow. 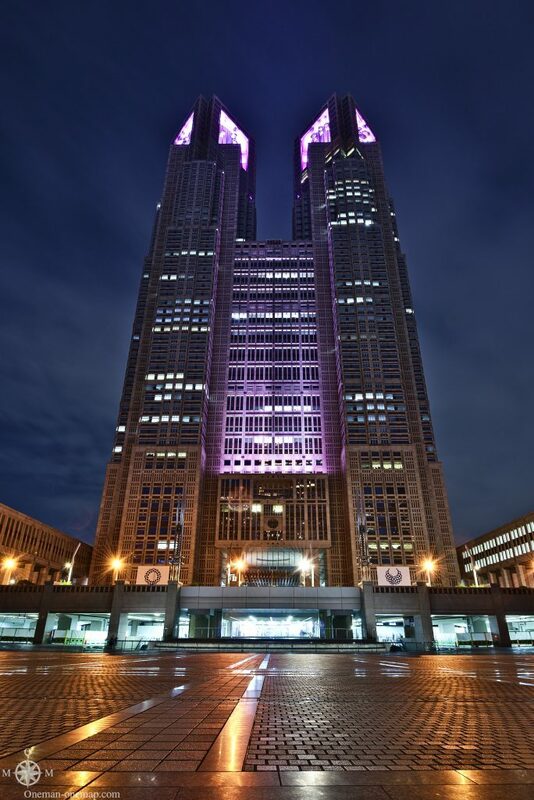 The Tokyo Metropolitan Government Building at night. The Japanese are usually very friendly and happy to help, but one has to distinguish between “generic friendliness” and “actual friendliness”. In many cases friendliness is simply expected by society and often degenerates into protocol. For example cashiers and restaurant staff are always extremely friendly and follow rituals like the meticulous packing and handing over of plastic bags, or the whole staff shouts a loud いらっしゃいませ (Irasshaimase, Welcome) every time a customer comes in. Every construction site has a couple of men waving with passers-by around the obstruction with colorful signaling discs and apologizing for the inconvenience. Young girls stand in front of many shops and encourage people to enter. Tourists are escorted all the way to their destination when they ask for directions. All this doesn’t necessarily have to do with actual friendliness, and the Japanese themselves don’t even react to it anymore. Also not everybody deserves friendliness. It can even go as far as a drunk or homeless person lying helplessly on a train platform in the morning and people flowing around them on their way to work. Girl in a traditional Kimono in Kamakura. 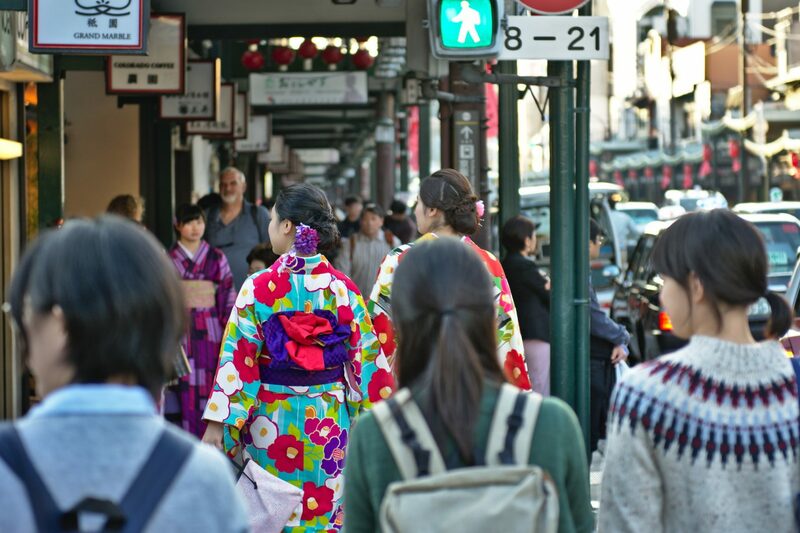 Many tourists are impressed by all the friendliness and happily make use of it, but you always have to keep in mind that you can easily put a Japanese person in an unpleasant situation if you ask for help that hasn’t been offered. Depending on where you are and what situation you are in it can be outright rude to talk to a person you don’t know. That’s especially valid for AirBnB, never just ask your neighbors! Do your homework and avoid ending up in a situation in which you have to bother someone. If you have to ask someone, then ask a person who’s job it is to help you or who’s at least being paid for it. Hotel reception, AirBnB hosts, tourist information, counter staff, bus drivers etc. If that doesn’t help, wait for a bit if someone comes around and offers their help. Depending on where you are especially the elderly might do this. If everything fails, ask someone who looks like they will be least bothered by you. Always express your thanks properly. In Japan I always had a few German sweets (Haribo, Maoam etc.) in my backpack for this case because they’re treasured. You can buy Haribo in Japanese stores nowadays, but they are still expensive and they just have the basic flavors, so I brought a couple of special flavors. Society’s expectations and the pressure to perform affect the life of pretty much everybody in Japan. Students study until they are exhausted and continue to work in school clubs or part-time jobs after school. Employees die by 過労死 (Karōshi, overwork death) if comes to the extreme. The suicide rate is one of the highest in the world, some people completely retract from the world and don’t go out of the house anymore for years on end. The number of these ひきこもり (Hikkikomori, pulling inward) has reportedly increased over the last couple of years. 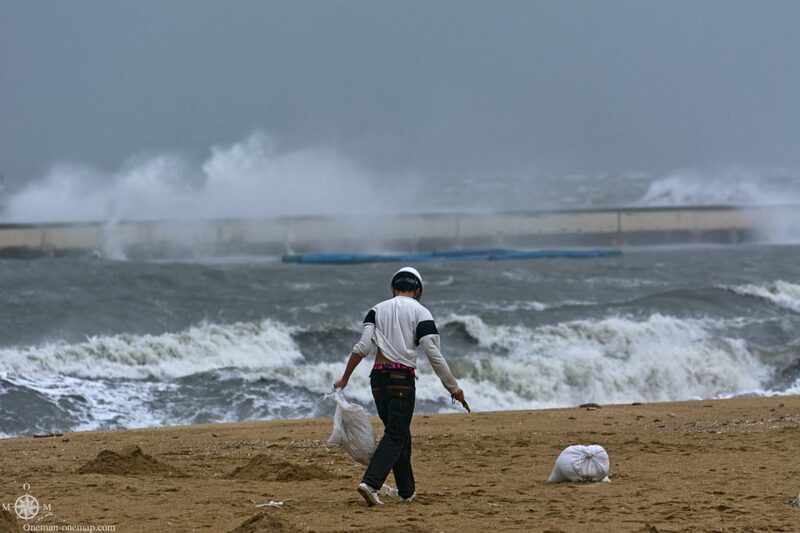 Cleanup during the Super Typhoon in Fukuoka. Yet it can be hard for foreigners to understand the will to survive of the Japanese in its entirety. During my trip I’ve visited the Fukushima Evacuation Zone, experienced a Super Typhoon and two tropical cyclones and talked to survivors and inhabitants for many hours. Even after that it was still unbelievable how it is possible to live in constant danger and even cope with the death of loved ones and friends with so much pragmatism. Japan is still quite sealed off from the rest of the world. Just about one percent of the population are foreigners, but about 50% of them come from China and another 40% from South Korea, so from sort of similar cultures. If Japanese women even marry a foreigner, the couple usually lives outside of Japan afterwards. Many foreign products don’t have much of a chance on the domestic market, strengthening the domestic Super-Corporations like Sony, Mitsubishi, SoftBank, NTT etc. Foreign Online Services weren’t really popular because the domestic offers were better adapted to the language and the country, but over the last couple of years Twitter and Instagram have gained a lot of market share. 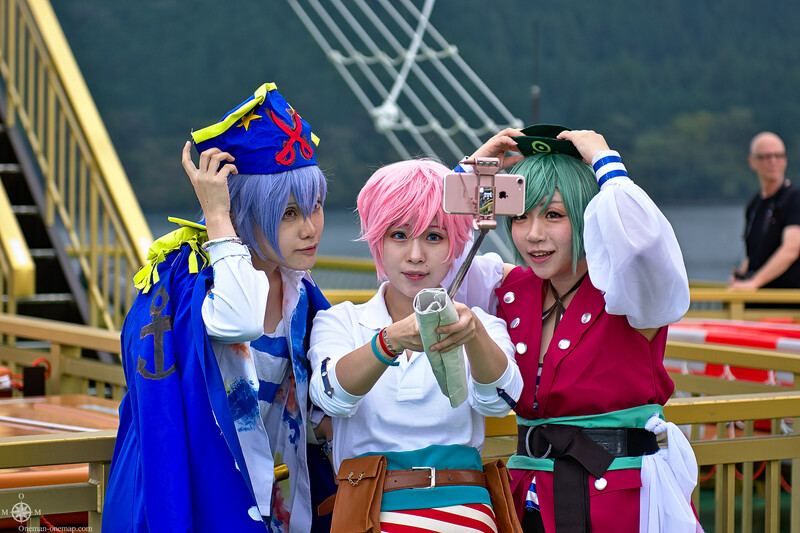 Cosplayers on a ship on Lake Ashinoko near Hakone. Many young people choose “extreme” hobbies to vent. Their small rooms are full of expensive computer games, gaming consoles and special editions of figurines from popular Manga comics and Anime. Or they dress up as their favorite character and take to the streets for some コスプレ (kosupure, Cosplay, from English costume and play). Cosplay was never a mass phenomena, though, even if the Western mass media liked to portray it as such. 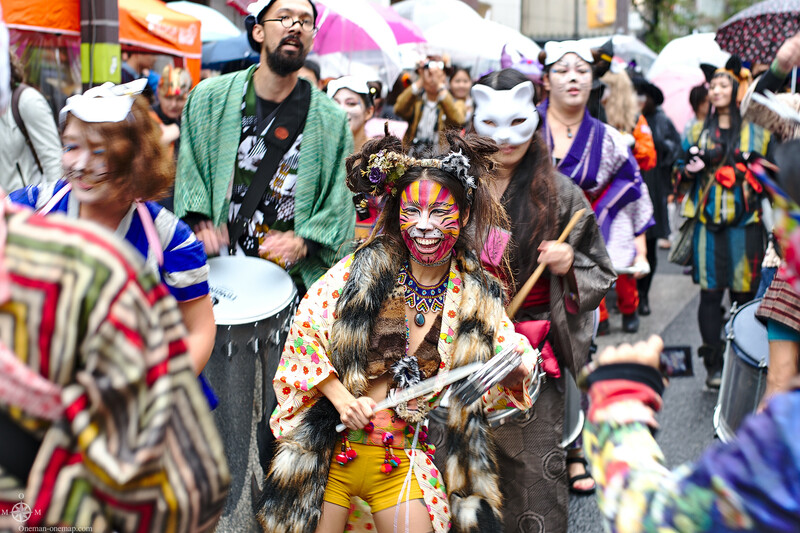 Participants of the Kagurazaka Bake Neko (“Monster Cat”) Festival in Tokyo. Statistically just about 40 percent of the population identify themselves as being religious, but by that they usually mean organized religion, which Shintō (神道) doesn’t count as because everybody can choose freely which shrine to visit when or even to build a private shrine. The maintenance of the countless shrines and other religious buildings all over the country by monks, nuns and priests and the execution of rituals is a bit ore like a service industry, and you often pay for it immediately. It’s completely normal even for salesmen to pass by a shrine on the way to or from work, put a 100 yen coin (about 75 Euro-cents) in the box and sound the bell for a bit of luck. 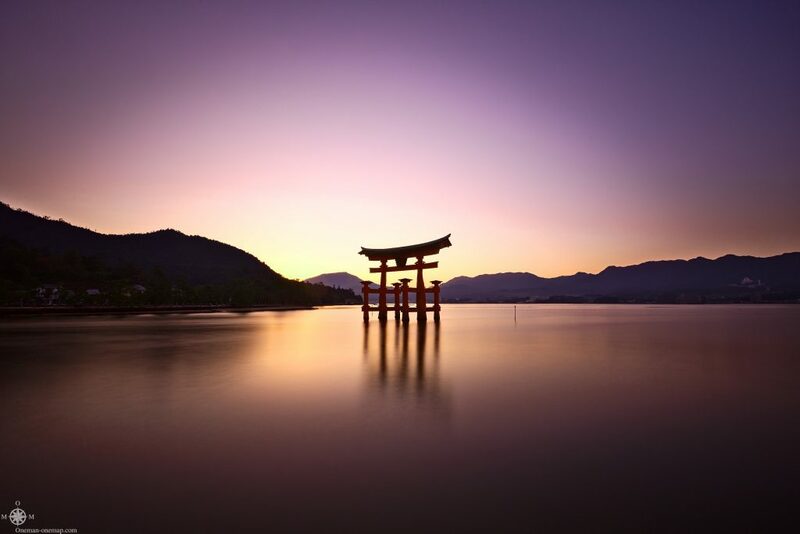 The Great Torii on Myajima, near Hiroshima. Religious celebrations, processions, rituals and public festivals (祭り, Matsuri) are held year round all over the country. 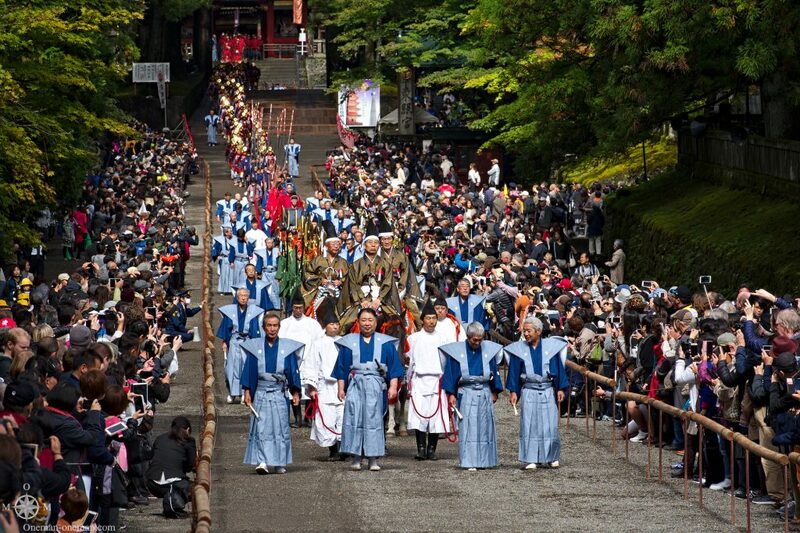 The highlight is usually a procession with the Shinto shrines. If you’re planning an extended trip through Japan, do try to align the route with these events! Hyakumono-Zoroe Sennin Gyoretsu, the Procession of the Thousand Samurais, in Nikko. The most important airports are Tokio-Narita (NRT), Tokio-Haneda (HND) and Osaka (KIX). Narita is especially served by long-haul flights from Europe and the United States of America, while medium and short-distance flights from other Asian countries often also use Haneda. Domestic flights and flights to China or South Korea can often be found for cheap even on short notice. 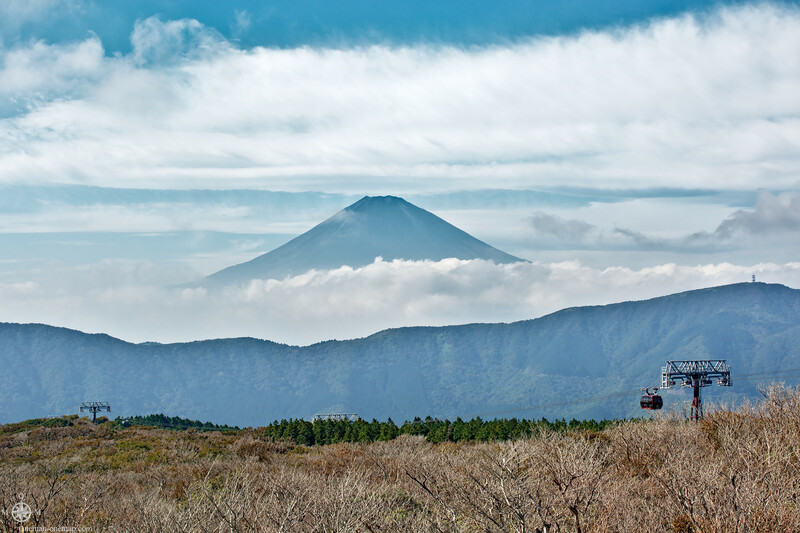 The Hakone-Tozan-Line train climbs the Hakone volcano near Fuji-san. Hundreds of subways, suburban trains, trams, regional trains, special trains, narrow-gauge trains, tourist trains, bullet trains, other railways, cableways and buses form the backbone of he transportation sector. Since the privatization of the Japanese National Railway (JNR) in 1987 all of them are run by private companies, but usually only the competitors of the present-day JR Group are being referred to as Private Railways. With the Shinkansen (新幹線, new trunk line) Japan built the first high-speed rail network in the world. Its punctuality is legendary, as are the prices for the tickets. A monthly pass for a distance of 100 kilometers is more than 800 Euros for example, while Deutsche Bahn prices a monthly ICE ticket for around the same distance at around 230 Euros. As a tourist you can save a low of money with the JR Pass, I will write a separate article on how to ride the Japanese railway system. 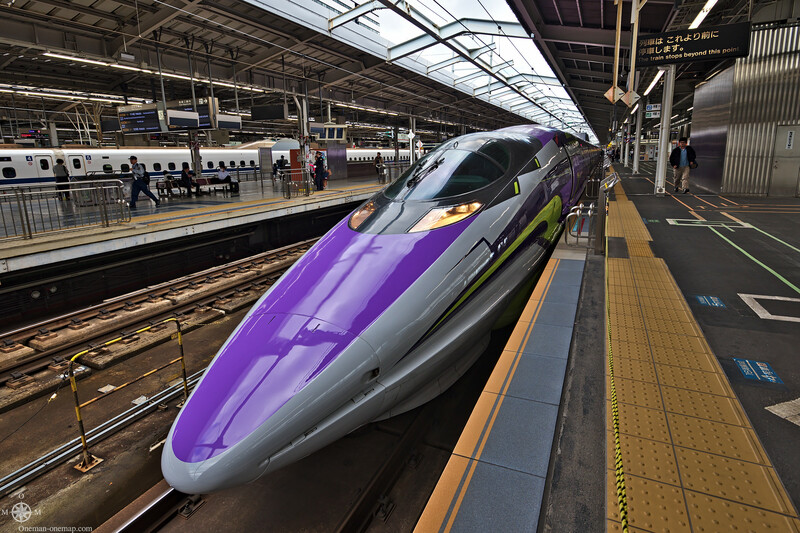 The Shinkansen 500 TYPE EVA, a special version of the Shinkansen 500 series adapted to the theme of the “Neon Genesis Evangelion” Anime. Buses can be a cheaper option on short distances, but you always have to keep on mind that the distances are quite huge. The popular Tokyo-Kyoto route for example is already 450 kilometers long, to Hiroshima its 800 kilometers, and down to Nagasaki even more than 1,200. The train or an airplane are pretty much the only viable options. If you want to rent a car in Japan, you have to have a drivers license from a country which is a member of the Geneva Convention on Road Traffic. Which is the case for the United States of America and most EU member states – but not for Germany, naturally. Many countries also accept the German drivers license out of goodwill, but Japan doesn’t. You absolutely need an official Japanese translation of the drivers license from the Japanese Automobile Federation. This translation should be applied for a couple weeks ahead, because you need a certified copy of the license and have to send the papers to Japan by express courier. Usually this seems to work out within days, but the JAF reserves the right to take a couple of weeks. Alternatively you can pick up the translation in Tokyo if you’re passing by their offices during the opening hours. In the end I didn’t choose to rent a car because it was possible to reach all my destinations by train, but that’s not true for every spot. Getting money at an ATM using my VISA card was not a problem. Not a single ATM decided to not accept my card, and all card terminals in all larger stores (Yodobashi Camera etc.) always worked. But cash is still king in Japan, and you should always have some with you. It was possible to shop Duty Free all over Tokyo as a tourist if you were sure that the goods were not left behind in Japan. Which was true every the time in my case, because I didn’t plan on leaving anything behind and saved the taxes. I didn’t have to do more than show my passport at the counter and save the receipts. When leaving the country all the receipts went into a big box at the airport, and that was it. 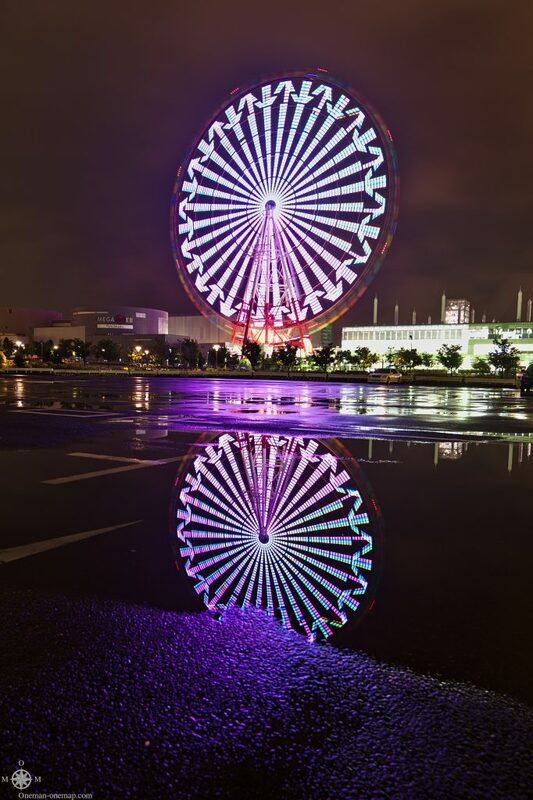 Ferris wheel in Odaiba, one of the most expensive parts of Tokyo. Contrary to popular belief, Japan doesn’t have to be expensive. During my 24 day trip I spent 809 Euros on transport (including 176 Euros for the flight from Busan and 445 Euros for the JR Pass), 1200 Euros for accommodation (exactly 50 Euros per night) and 390 Euros for food (about 16 Euros per day). Considering that I almost always stayed in fully furnished AirBnBs in the city center, traveled alone and traveled 5,200 kilometers by railway, it was more than okay. I have rarely eaten such good food at such low prices. Everything was available in all price ranges, and in stark contrast to most other countries the instant meals available at the convenience stores were of very good quality. There’s a simple reason for this: It’s completely normal for students and salesmen not to have time to cook. Many also have to travel large distances by train late at night. At least on the Shinkansen it’s normal to buy an instant meal before the train leaves, have it heated up and then eat it on the train. Once you’re used to this, you quickly learn that you can e.g. 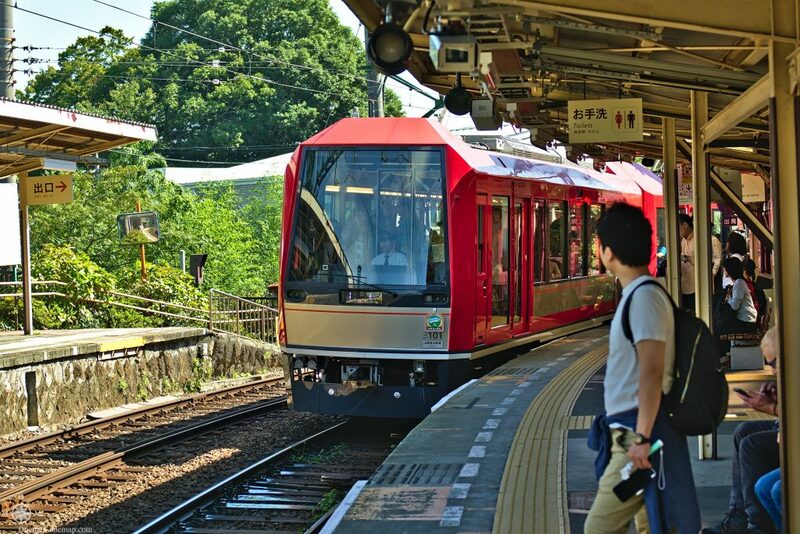 go from Osaka or Kyoto to Himeji for the day and don’t have to schedule extra time for meals. Japan is the country of the vending machine, by the way. 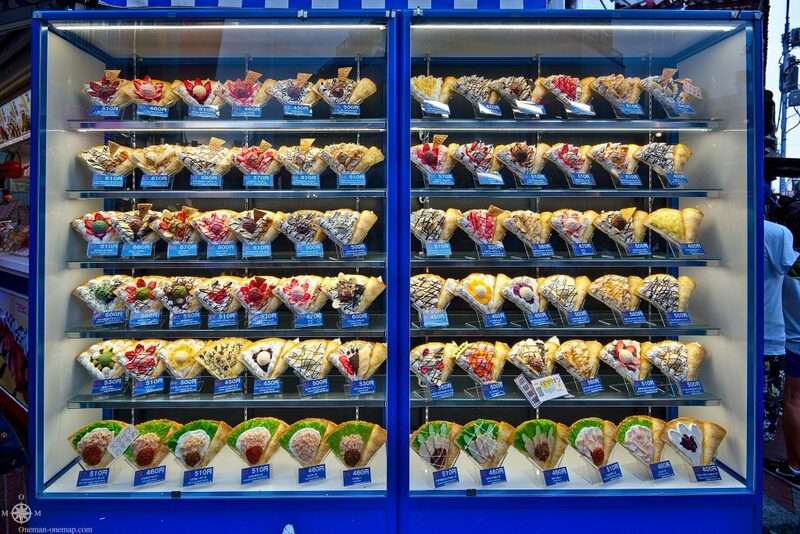 There are supposedly one million vending machines on the streets of Tokyo alone, selling everything from cold and hot beverages and ice cream to hot soup. If you want a more human touch, you can find a convenience store run by 7-Eleven, Lawson, Family Mart, Circle K or one of the many other convenience store chains at every corner. Supposedly there is one convenience store for every 3,000 people (about 43,000 stores in total). Like in South Korea it is not easy to get a SIM card in Japan. Until 2016 it was not allowed to sell fully featured SIM cards to foreigners because of anti-terrorism laws, you could only buy data-only cards. Mobal started selling fully featured SIM cards to foreigners in early 2017. Prices for data plans are quite high at 30 to 40 Euros for 15 days and 60 to 70 Euros for 30 days, and there are no 2G networks. Many operators run 3G on frequency bands which are not being used in Europe or use the CDMA EVDO standard which is incompatible to UMTS. 4G networks often also use the frequency bands in the 700 and 800 MHz ranges, which are not supported by many (especially cheaper) smartphones. The situation keeps changing all the time though, I recommend looking at the corresponding page on the Prepaid Data SIM Card Wiki. In practice there are usually enough WiFi hotspots, but not on the Shinkansen!